Exploration of two middens (refuse heaps) at Qatar’s prominent archaeological site of Wadi Debayan, with human occupation dating back to about 7,500 years ago, could unravel the story of the Gulf region itself. Wadi Debayan, situated on the northwestern side of Qatar to the south of the site of Al Zubara and the site of Al Zubara and the Rá’s ‘Ushayriq peninsula, is being explored as part of the Remote Sensing and Qatar National Historical Environment Record (QNHER) Project. A joint initiative between the Qatar Museums Authority and the University of Birmingham, the current season’s excavations recently completed with the next season to start in October. “The middens, located a few hundred metres apart have yielded some surprises and could hold more,” the director of archaeology and heritage, Dr Sultan Muhesen, told Gulf Times. Radiocarbon dating of the first midden, suggests it started accumulating around 5,200 years ago and stopped abruptly around 4,500 years ago. The first midden has revealed substantial bone deposits, mainly fish bone and some animal bone and shells, whereas the second midden is predominantly shells. “Middens are normally associated with either processing food material for transportation to a more distant site or waste materials from the settlement,” explained project co-director and Head of Antiquities, Faisal al-Naimi. The presence of vast quantities of fish bones could indicate the possibility that the ancient inhabitants of Wadi Debayan may have exported dried fish. The midden with an abundance of fish bones also shows the impact of rising sea levels through tidal reworking and periodic waste accumulation. “Episodes of burning suggest this is a site people returned to over and over again. So obviously it holds quite significant importance to whoever was in the wadi at that time,” observed Peter Spencer, site supervisor for the excavation area. Emma Tetlow, environmental manager for the QNHER Project, stated that the shell-laden midden contained very different shells to those found in the other midden. “This perhaps suggests that the inhabitants were exploiting two very different coastal environments. While the first midden suggests sandy and rocky shorelines, the shells from this one are from a muddy mangrove environment,” she explained. Spencer was of the view that the diversity in the contents of the middens proved the existence of completely different environments side by side. 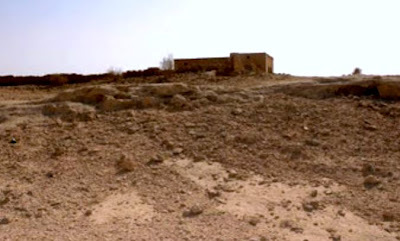 “Occupation in the Wadi Debayan appears to have stopped very abruptly around 4,500 years ago, when we have evidence for a tsunami or high energy event which overlies the midden” explained project co-director, Richard Cuttler. “We are not just looking at the story of Wadi Debayan, but also at that of the Gulf. We are looking at sea level increases, decreases, environmental changes and the people of the Gulf used the resources of this area in completely different ways,” he said. The researchers are now waiting to get a radio carbon date for the area containing the second midden. “We will have a definite date before the next season of exploration begins,” Cuttler added. Gulf Times recently reported the discovery of an unmarked grave and remains of a human skeleton from Wadi Debayan. More work is to be conducted on the grave the next season.